ItemA-00841 - The Colonial Secretary's Office; The Colonial Office, Victoria, Vancouver Island, B.C. ; The Governor's Office. 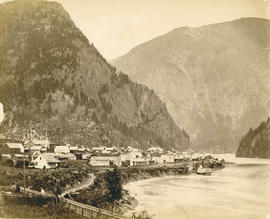 ItemA-00902 - Yale, Fraser River, B.C. ItemA-02997 - Fort Street, Victoria, BC. 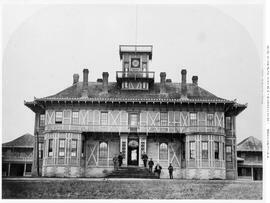 ItemA-02567 - The Guard House, Government House, Victoria. Source of title proper: Title based on the title of the album. 1 leather-bound embossed album containing 49 black and white photographic prints. May have been a transfer from the Legislative Library. This album was produced in response to a request from the Secretary of State for the Colonies who sent a circular dated 29 November 1869 to all colonial governors requesting albums of photographs. They were instructed to send "photographic views of noteworthy buildings and scenery" to the Colonial Office. Governor Anthony Musgrave was ill and so the request was not acted upon until April 1870. This album is a duplicate of one which was held by the Foreign and Colonial Office in London, and was presumably kept as the Colony of British Columbia's copy. The album is a brown and leather-bound, and contains 49 views of British Columbia said to have been taken between 1867 and 1868. The images include photographs of Victoria, Esquimalt, New Westminster, and various views taken along the Cariboo Road and in the Cariboo gold mining district. The selection of views was intended to illustrate the prosperity and future prospects of the Colony of British Columbia. This type of album was made to order by Dally in his photographic studio from a selection of prints chosen by the purchaser. The captions are presumed to have been written by Dally. Albums have been digitized and are available to view on the A/V kiosk in the reference room. For conservation reasons, no access is provided to either the album or any of the original glass plates from which these views were produced.